Cover painting for John Timpson's debut novel. 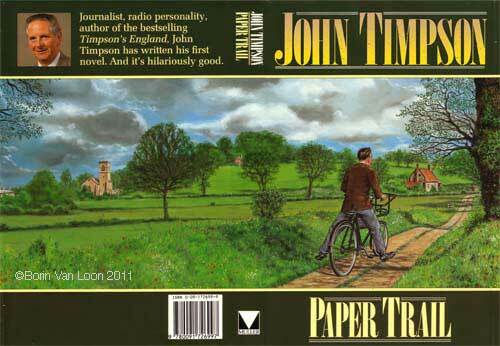 Cover painting for the sequel novel by John Timpson. Having visited the Hutchinson art director, Patrick McCreeth, to show him my portfolio in my early days as a freelance illustrator, after some years (!) I received a 'phone call from Paul Sidey, art director of Frederick Muller (then part of the Hutchinson Group). 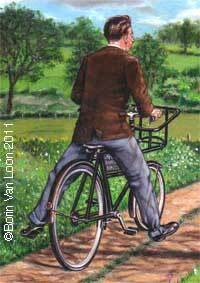 Apparently when the subject arose of a cover painting for John Timpson's first novel based on his experiences as a cub reporter in East Anglia, Paul had said "If only we could find an East Anglian illustrator..."; Paddy McCreeth hearing this said: 'I know one - Borin Van Loon - he could do it" and Jeff Cloves, reader for Muller (with whom, by chance and completely independently, I'd had a long correspondence years before when I was struggling to find a way into a creative career) who was also in the room added: 'I know him... he's good." Such are the chance occurrences which lead to a speculative 'phone call and a freelance job. I received and read the typescript of the relevant chapter of the book. Having reminded myself of the dimensions of a Demy Octavo book and allocated 20mm to the putative spine width, the idea of a full size wraparound cover appealed greatly. I set to with roughs for a rural Suffolk'ish landscape with a cyclist (the lettering on the old-fashioned cycle's tradeplate readable) approaching the viewer up a country lane, as briefed. I've illustrated a lot of cyclists and bicycles over my career and although those ellipses are a challenge, this was pretty straightforward (or so I thought). 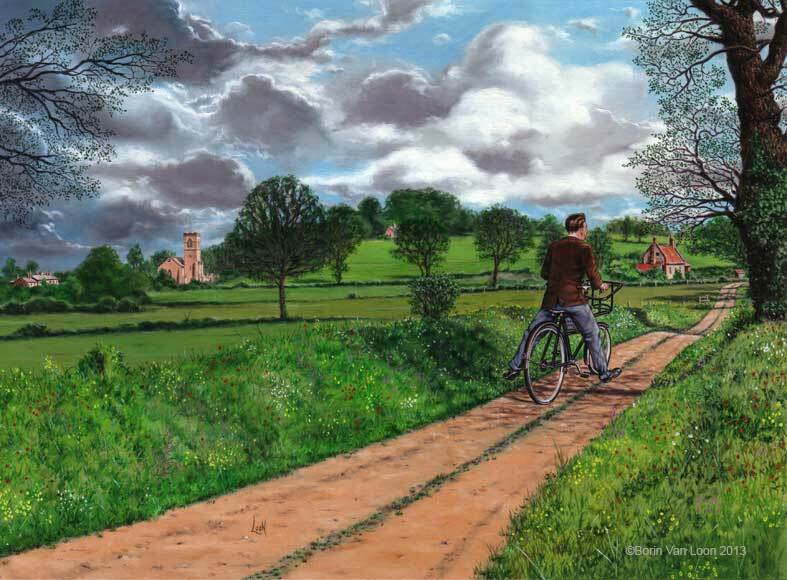 An expansive skyscape, the sun cutting underneath dark clouds from the right, hedgerow flowers, two trees in the hedges to delineate the front cover panel were all included in the delivered rough. A pinkwashed house would nestle in the trees to coincide with the spine and leave room for the spine lettering. The first thing to be objected to was the central tree (the sky needed to be left clear for typography), then the fact that the cyclist should be smaller, the plate unreadable and he should be going downhill away from us. And a background tree was still too big. There followed a to-ing and fro-ing over the legs akimbo posture of the protagonist on the sit-up-and-beg bicycle. I finally satisfied the art director and produced my full-scale painting in oils on primed board-mounted paper - easier for the drum scanners of the time. All in all there were probably ten roughs: rather more than I would have liked and each time my painting was getting emptier and emptier, allegedly to leave plenty of uncluttered background for typography. Some time later, I chanced to be in Vauxhall Bridge Road at the time the cover was printed and wrapped around the hardback novel for the sales force and to send for review. I discovered that my painting had been heavily cropped at top and bottom with a dark green background and, as Jeff Cloves described it, metallic gold, chocolate boxy lettering. I still think it would have been better with a full-bleed cover illustration with lettering either floating against sky and road backgrounds (as I had originally intended) or in panels in the same positions. But then I would, wouldn't I? However, I had the original painting returned to me, so I can show it in full here. Some time later I attended a Suffolk Book League talk by John Timpson at Ipswich School and introduced myself to get my copy signed; the former Radio 4 Today Programme presenter was as charming as you might expect and I went on to paint a cover for his second novel 'Sound tracks' (also shown above). This time the available print area was a long, thin wraparound strip to match the design of 'Paper trail'. The requirement was for a steam engine arriving at Toftham railway station to take our hero to his new job at the BBC. The Norfolkman locomotive billowing steam and smoke made a great subject to paint, the gas lamp standard was placed to sit on the spine of the book and one of the advertising hoardings on the posters featured Broadcasting House. A dazzling East Anglian cloudless sky and crosswind made striking backdrop. Sadly, there was to be no third novel in the planned trilogy, but it was fun while it lasted. Above left: Borin's display screen in The Big Draw exhibition, atrium of Endeavour House, Ipswich, Suffolk in October, 2008 which features a blow-up of the Paper Trail cover painting. 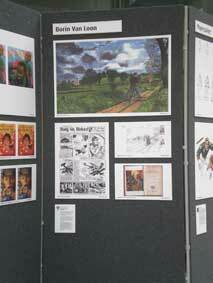 Also shown: a collage comic strip page, Bung Ho, Blokes! from The Bart Dickon Omnibus.